Cool Out Sun's N'Fa Jones is no stranger to WOMADelaide. He appeared twice in 2018 with REMI x SAMPA and sat down to chat with The Pin for a special Artist In Conversation. 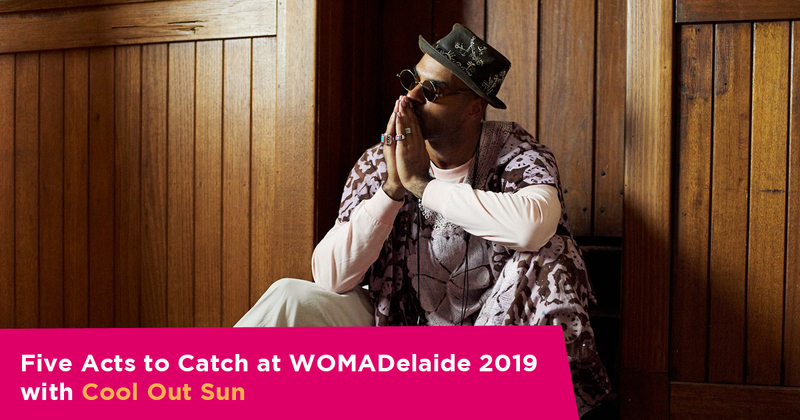 Returning in 2019 with the combined musical powers of Nui Moon and Sensible J, we got the word from the artist credited for establishing the Australian Hip Hop movement, about who he's excited to see at WOMADelaide 2019. Number one on N'fa's list was the "powerful African songstress" Fatoumata Diawara. "Fatoumata's timeless voice evokes the spacious imagery of Mali's Sub-Saharan landscape" said Jones. Playing two shows at the festival, Diawara has established herself as one of the most inventive singers and electric guitarists in Mali and Cool Out Sun are very much "looking forward to experiencing that". Born in 1961, Hamid El Kasri is not a Son of Maalem himself but he grew up in the middle of the Gnaoua Culture. Praised for rejuvenating the genre while keeping its authenticity alive, he has become a master of the guembri. "The Maalems of Gnaoua Culture or trance music offer a window into the deep ritual music of North Africa. Trance did not start with techno, it began in the desert". They've found fans all over the world, from Iggy Pop to Haley Joel Osment to Lee Hyori, Korea's biggest pop star and add to that list N'fa Jones. "We find this trio heaps interesting. The way they blend genres, eras and dimensions while remaining funk heavy... is a vibe". A good vibe we might add. Multi-instrumentalist, producer, engineer and DJ, Kiwi artist Lord Echo has crafted a sound that is instantly recognisable and as N'fa puts it "is dope." "Soulful, bouncy, blending heavy and light sonics in a real cool way," Echo "features mean vocalists on the record too" (Mara TK, Lisa Tomlins & Toby Laing). Sunday Night is the night to experience the grooves of Lord Echo, "with a 6-piece live band in hand... Yup yup". "Thando is a star and like family to the House of Beige" (N'fa's record label based out of Melbourne). "Her voice and energy are infectious in the best kind of way". The singer'songwriter has had a huge year in 2018, releasing single "Numb", her second EP, collaborated with WO '18 artist REMI and supported Leon Bridges on tour. N'fa Jones calls Thando "a must see" at the festival, crediting "cool music, poignant lyrics and soul soul soul". Cool Out Sun have just released their highly anticipated, self-titled album, selling out their album launch and rocking the airways of Triple J and Unearthed. The Music have described single Fire For (Fire Four) as a "blend of language, culture rhythms and groove, all represented wonderfully in their debut clip." We can't wait to see Cool Out Sun fire up the audience. Friday and Sunday night, be there.